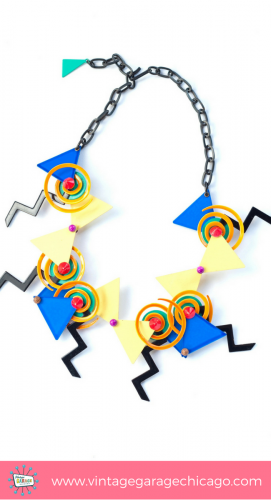 The story of Memphis Style Jewelry begins in 1980, when architect/designer Ettore Sottsass started putting together a collective of designers in Milan. After the repeated listening of Bob Dylan's "Stuck inside of Mobile with Memphis Blues again" during a meeting, He named the group "Memphis". 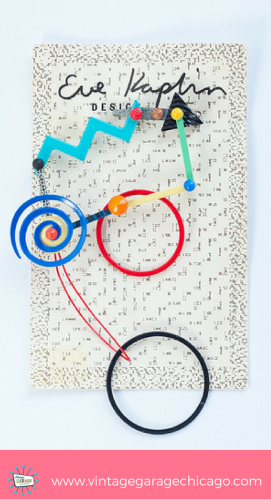 In 1985 Los Angeles based Memphis designer Peter Shire first worked with Acme Studio producing a line of 12 brooches called, "Melrose Emblematic". The pieces were made of metal and enamel. 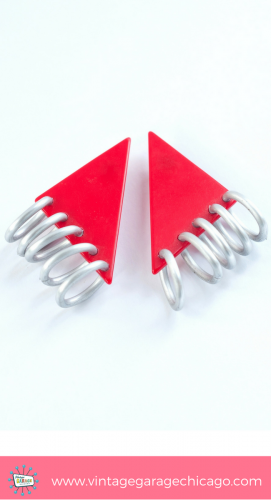 In 1986 Memphis designed over 100 pieces of jewelry for Acme Studio. Included in the collection are designs by Acme co-founder Adrian Olobuenaga. This is the only "official" Memphis Group jewelry collection. This group consisted of the following designers- Alessandro Mendini, Martine Bedin, Andrea Branzi, Aldo Cibic, Michele de Lucchi, Nathalie du Pasquier, Hans Hollein, Arata Isozaki, Shiro Kuramata, Matteo Thun, Javier Mariscal, Luciano Paccagnella, George Sowden, Marco Zanini, Ettore Sottsass. See the Resources below for links to learn more about the official jewelry. The style was soon copied by others with varying degrees of success. Good Memphis style should remind you of a cross between Art Deco and Pop Art, a pair of Chandelier earrings should be more than a mobile of bright colors and geometric shapes. Her signature collection was called Mechanical and Mobile. Playful, moveable, architectural type pieces with a sense of fun. 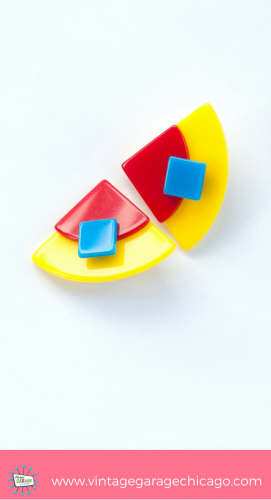 Colors were bright and primary--it was the 80's--and shapes were bold. In time, many people attributed the look to the 'Memphis-Milano' movement made popular in the 80s by Ettore Sottsass and Michael Graves. Eve herself never claimed to be one of them. (from Eve Kaplin Designs Facebook page) Eve's life was sadly short. She passed away at 29 years old. Her designs were obviously influenced by the Memphis movement. Kaplan jewelry is a solid maker to collect. The 2018 Vintage Garage dates are April 15, May 20, June 17 , July 15, August 19, September 16, and October 21. There will be 100 vendors offering cool vintage and antique pieces every 3rd Sunday, April to October. Vintage Garage is located at 5051 N. Broadway, Chicago, IL 60640. Hours are 10:00 am to 5:00 pm with a $5 admission. Official website is www.vintagegaragechicago.com.